The Granite Tower (GT) staff went through some rocky times during July and August. At a new starting point, we had to adapt to changes; new position, new rules, and new people. To be ready for writing and editing articles, we sat up all night during journalism training session for two weeks. Some cried, bumping against their personal limitations. At those moments, we sat around, facing each other over a table. In our office, or in a shabby pub, with a cup of drink in our hands, we shared our thoughts on diverse issues regarding university lecturers, democracy in Korea, or Turkey-Syria conflicts. As the atmosphere around us got warmer, we started to open our hearts and comfort each other. After long sweet chatter, we always missed the last bus, walking home or getting ourselves in a taxi. However, compared to the bright and happy times we had inside the office or the pub, things we saw outside were still dark. Police cars were moving all around the city to eradicate alcohol abuse, and the taxi drivers we met spoke candidly of their difficulties. People we witnessed in real society were like zombies. In this September issue, we wanted to convey what we saw. We covered the taxi drivers’ predicament and other various campus issues from our own perspective. Through the column about zombies, GT analyzed how the media expressed this gloomy reality. Among such grim and bleak articles, Cover Story tries to show how drinks can be a consolation to our society, if not abused. The sweat and toil of reporters and associate editors dwell in our magazines and within the GT organization itself. As one editor-in-chief, scolding or pressing them and watching them endeavoring at the same time gives me a heartrending agony. Though, to our staff, driving forces are readers’ attentions and voices to our magazine. 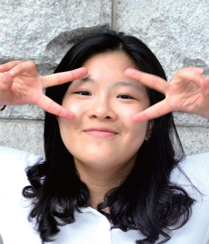 This semester, GT will do its best to listen to the voice of Korea University (KU) students and our readers. I humbly ask for your comments. Right now, writing this letter in my room at midnight, Rachael Yamagata’s song gently rings my ear and a can of beer is standing beside my laptop. With a serene smile, I’ve been reminiscing about the last two months and the world around me. How bitter and sweet it is to have such a fleeting moment of happiness! I hope this September issue can give such precious moments to our readers.